New, streamlined application systems built for PPACA are making it easier for people to enroll in government benefit programs, including insurance coverage and food stamps, the Associated Press reports. 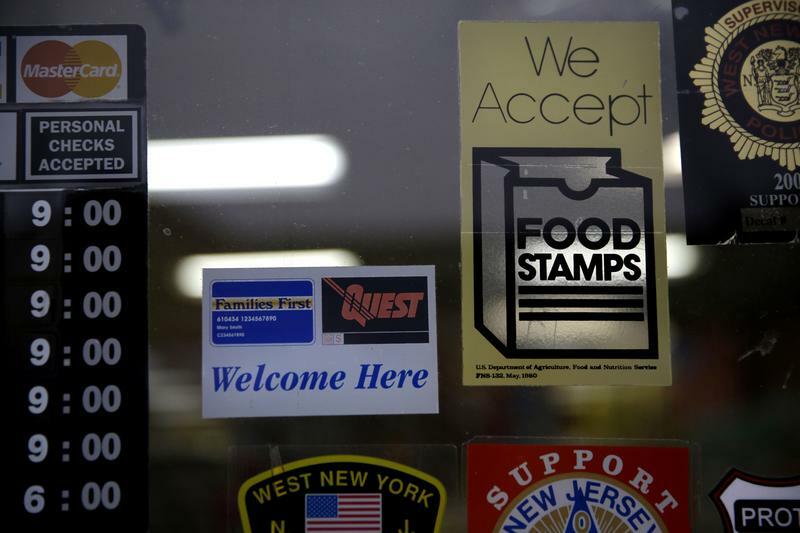 A supermarket displays stickers indicating they accept food stamps in West New York, N.J., Jan. 12, 2015. Photo: Seth Wenig/Associated Press. Is the government mastering the public enrollment process thanks to its experience with signing folks up for Obamacare coverage? An analysis by the Associated Press seems to indicate just that. Although other research has indicated that the insurance exchange enrollment process is getting better, AP’s evidence comes from enrollment patterns elsewhere. The news service looked at the number of folks in this post-recessionary period who were enrolling for food stamps. During a time when food stamp enrollment historically would be dropping, AP found that, instead, it’s on the rise in some states. And most of those states — 10 out of 11 — were states that chose to expand Medicaid as permitted by the Patient Protection and Affordable Care Act. Enrollment in those states is increasing despite Republican efforts to limit access to food stamps. AP noted that there have been no eligibility policy changes that would have opened the program up to millions of more Americans. The perplexing food stamp enrollment increases weren’t huge, mostly in the 1 percent to 6 percent range in state-by-state comparisons. One exception: Nevada, where enrollment shot up 14 percent. The price tag for feeding the 632,000 people added to the program in those 11 states is estimated to be $79 million a month.